The Westerlund 2 stellar cluster contains the most massive binary star system, WR 20. Envelopedby charged bubbles, a cluster of young, massive stars has revealed a new sourceof gamma-ray energy in our galaxy, astronomers reported today at the firstGamma Ray Large-Area Space Telescope (GLAST) Symposium in Palo Alto, Calif.
Gamma rayshave the smallest wavelengths and have more energy than any other light wavealong the electromagnetic spectrum. Until now, supernovaeremnants were the dominant known source of gamma-ray energy, which requires asort of celestial particle accelerator to ramp particles up to such highenergies. 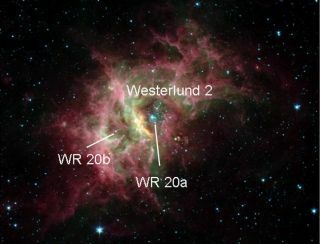 CalledWesterlund 2, the cluster contains an ensemble of young stars and extremely massive stars calledWolf-Rayet stars, one of which--WR 20a--takes the trophy for the most massivebinary known in the Milky Way. Eachof its stars weighs 80 solar masses. Wolf-Rayetstars, named for their discoverers, begin life as cosmic Goliaths, boastingat least 20 times the mass of the Sun. Near the end of their lives, the giants rapidlylose mass as supersonic stellar winds jet from their surfaces. Intense heat andradiation at their cores can trigger stellarwinds that reach speeds that range from 2.2 million to 5.4 million miles perhour (3.6 million to 9 million kilometers per hour). Theirquick, tumultuous lives end when they explode as supernova and blast massive amountsof heavy elements out into space. Theinternational team of astrophysicists spotted the star bubbles with the HighEnergy Stereoscopic System (HESS) gamma-ray telescope array located in Namibia. Theastronomers said the gammaradiation appears to extend beyond the stellar cluster and shows a constantemission rate over time, suggesting the acceleration is the result of stellarwinds. In theWesterlund 2 cluster, the whipping stellar winds have actually blown bubblesaround the stars. The scientists found that the wind energy is nearlyequivalent to that released in supernovaexplosions. What drivesthe explosive winds? "[The stars] provide really massive particles which aredriven out with the wind. But that is for sure not energetic enough yet topower up to the energies we are talking about here," said co-researcher OlafReimer, a senior research scientist at the Kavli Institute for ParticleAstrophysics and Cosmology at Stanford University. When thestreams of energetic particles encounter the shock-wave boundary at the edge ofthe bubble, they get a boost of energy. "The particles encounter a density gradient, and they always pick up a tiny bitof energy," Reimer told SPACE.com. Thescientists think the energetic boost is sufficient to match the atom-smashingpower of a particleaccelerator and launch particles to gamma-ray energies. "Shocks andturbulent motion inside a bubble can efficiently transfer energy to cosmicrays, providing a plausible mechanism for particle acceleration," said Luke Druryof the Dublin Institute for Advanced Studies.